In a shameless ploy to get Baby Chino’s History and Live some attention, I agreed to have him make me breakfast in bed. Aren’t I nice? This morning we were travelling back in space and time to Ancient Greece, through the tried and true portal of porridge. According to the authors of The Classical Cookbook ancient greek women who knew about herbs could use this porridge, or kykeon, for dangerous purposes – like sending men to sleep, or worse! I had an immediate insight into how the Athenians built the Parthenon, how Pythagoras birthed his theorem and how Sappho had the strength to articulate her passionate poetry: they were all essentially fuelled by cake. I could not contain my delight at having an excuse to eat such a thick, creamy batter for breakfast. There was a pleasing grittiness to this pale, slightly cheesy mass. A hint of honey transported me to the Elysian fields; as if I were lightly traipsing through them, sunlight reflecting dazzlingly off the golden fleece I’d be wearing, as well as off my perfect Grecian curls. That was all in the first mouthful. Subsequent mouthfuls became more and more laborious; indeed, Heracles would have been proud of me for eventually finishing such a task. It was exhausting, luckily I was already in bed so I could comfortably lapse into a food coma. Baby Chino thus truly succeeded in channelling those Ancient Greeks, or at least the women who knew about sleep herbs. I would not recommend this as an every day food, at least not for anyone who wouldn’t use the subsequent energy to throw a discus or run a marathon. After having such a positive experience at Cafe Lua more than a year ago, I had no hesitation recommending this cafe/art space as somewhere relatively central to meet some old and new breakfast companions. 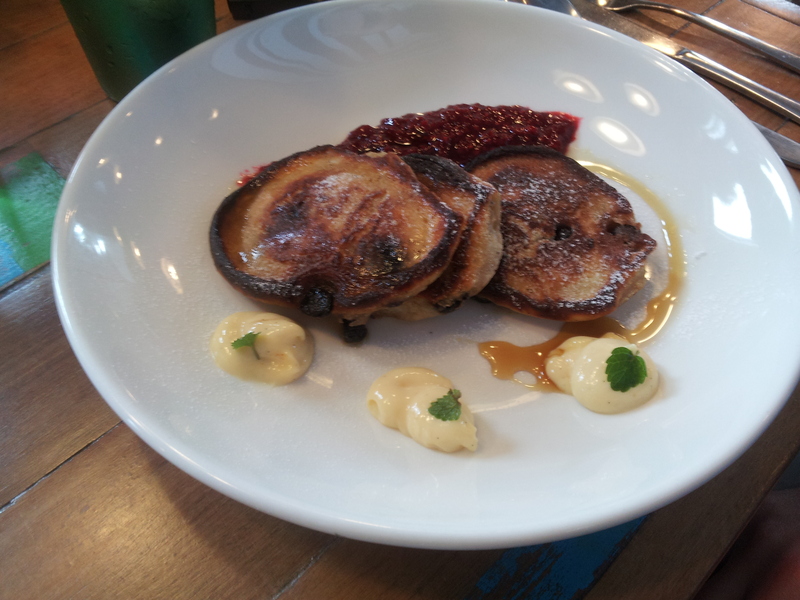 Yes, it might be slightly pricey, but I this was a special occasion – I was showing off to Short Stack and Madame Bacon. I do like porridge as it is the warm, mushy cousin of muesli; however on a sunny Spring morning being greeted with the prospect of porridge when muesli was expected is kind of like being given work clothes for your birthday – useful, potentially tasty, but a bit disappointing. 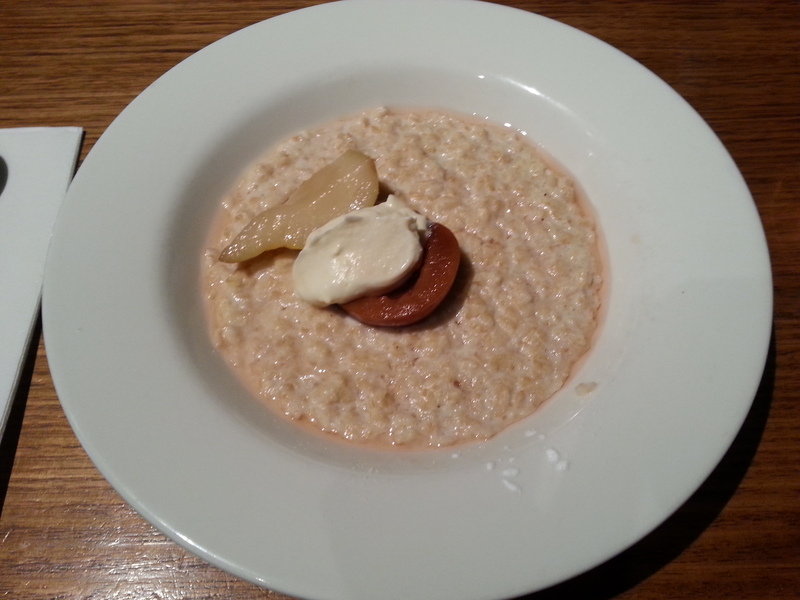 Firstly, porridge should not occupy the bottom quarter of a wide, shallow bowl. Secondly, regardless of what amazing ingredients might have been used to create this dish, the first overwhelming mouth impression that I got was that it was tepid. My next course of action was to find solace in the rhubarb…and it was cold. The horror. THE HORROR! Yes, I suppose I could have asked for them to warm it up but honestly, at this stage I was wallowing in self-righteous indigence at the travesty of having to wait almost an hour for cool porridge and have to eat it at a time that can only be described as brunch. Brunch! Not even creamy, coconutty oats are going to save a lukewarm porridge from being one of the worst things ever. It is like whoever made it did not care one bit – and apathy is something I cannot abide. I do not enjoy being disappointed and this one stung badly. Final Word: If you are out to breakfast and are feeling masochistic, go to Cafe Lua and try their porridge. 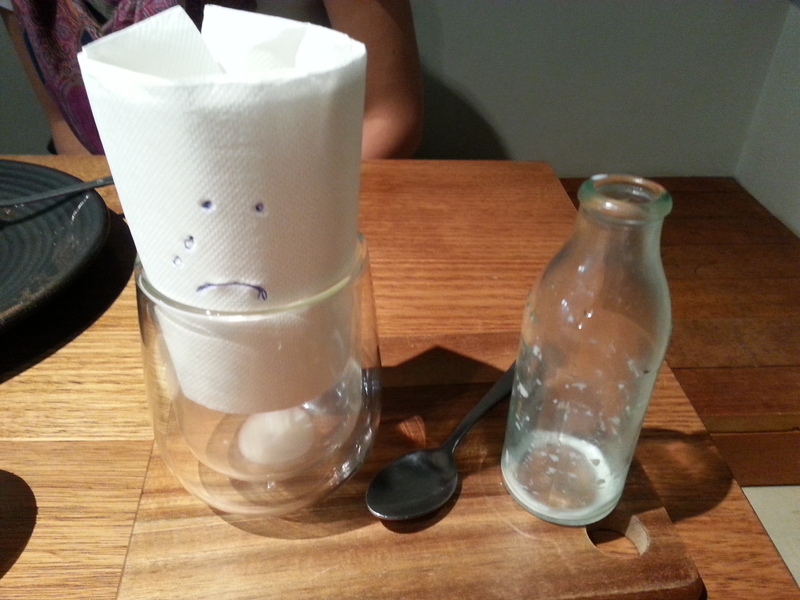 (Not So) Good Muesli, Melbourne! I am always glad to discover new pockets of Brunswick – the suburb is like the Mandelbrot sequence, it expands and repeats infinitely on closer inspection. The west end of Albion Street forms the particular permutation of Brunswick that I visited recently with Baby Chino. We were meeting Ms Sourdough and the ever-unpredictable Doctor Dessert to see them off before they embarked on a European road trip – with the most important topic of conversation being my upcoming responsibility over a very determined (possibly more perseverative, as in what can occur following a frontal lobe brain injury), food-obsessed cat. I was surprised to find that Lolo and Wren sits within a sort of super-apartment-shop-cafe complex that suddenly appears out of the surrounding housing and is itself adjacent to large mounds of dirt. What is going on there? Who knows, but I’m sure this little self-sufficient community has it covered. The cafe itself is very tidy, with the stand out feature being a wall with a teal circular pattern surrounding their quaint bird mascot. I have a newfound appreciation for teal, it is a nice choice to lighten a room and complement whites, greys and brown – colours that Lolo and Wren really goes in for. 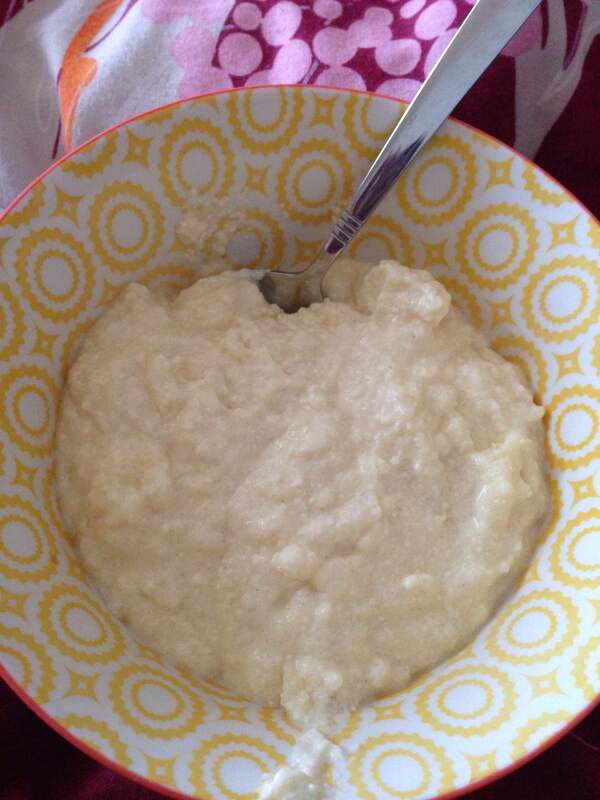 What manner of porridge is this? The Greedy-Gert in me rubbed her chubby fingers with glee, while my somewhat artery-conscious brain quivered in horror. This is probably the best example of breakfast dessert I could ever hope to come across. I should have twigged from the name – I was misreading it as “Banhoffe” thinking it was going to be some German twist on porridge (not that I thought Banhoffe meant anything, maybe it was a place?) – “Banoffee”, the internet tells me, is a neologism formed from banana and toffee. Oh boy. The Lolo and Wren porridge was deliciously creamy, with the oats and banana warmly congealed into a delightful chewy mush. 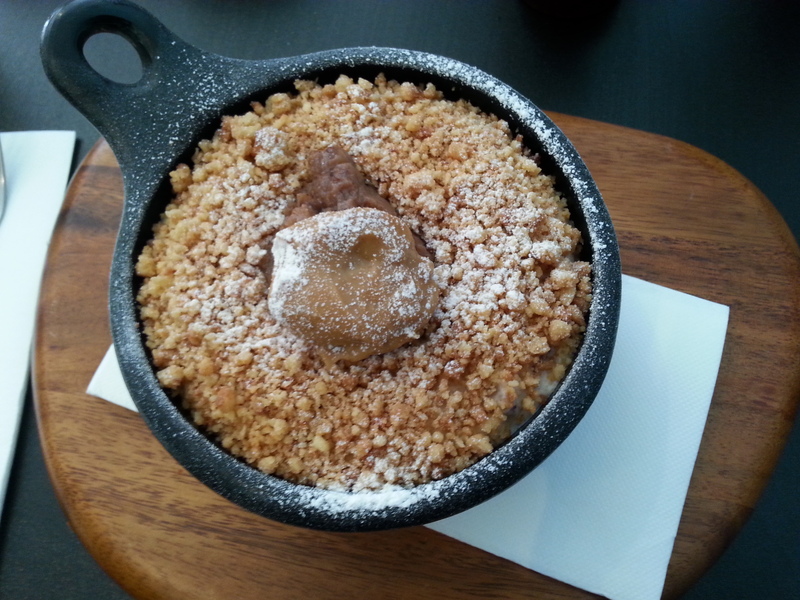 The top was a coconutty crumble that was just perfect for reminding me of many a happy dessert-time. Dulche de leche is condensed, sweetened milk and was dolloped on top alongside a date paste. As if this needed more sweetening! Thinking back, it’s rather obscene how much of a comfort food the Banoffee porridge would be – if only I was moping about something at the time! Probably because I was relatively happy I was unable to finish the dish, though not for want of trying. It was overwhelming. I’m feeling full just thinking about it. Final Word: Burrow your way into the warren that is Brunswick and seek out Lolo and Wren. If you are cold, sad, in need of comfort or just really, really hungry order the Banoffee porridge. Be warned: It will overpower you with comfort if you let it. Undaunted by last week’s failed foray into porridge, I decided to take advantage of the benevolence of Lady Grey whose maternal instinct now extends to buying her moved-out-so-must-be-starving (or at least that’s the act I maintain) daughter breakfast once in a while. I did not have any idea where she was taking me, I only hoped that when we got there that I would be greeted by a menu that did not smugly slip in a ‘semolina’ or ‘sago’ in front of my now-coveted winter breakfast. We managed to survive the gauntlet that is Albert Street in Brunswick, dodging and weaving around parked and moving vehicles alike, to arrive at Clique3. This was a warmly lit, cosy place offset nicely by the grizzly, overcast street outside. Of note there were inverted wire ceiling fixtures upon which dark butterflies alight – or perhaps I’ll decide to interpret them as moths, as we do not see enough of these hairy oddballs in decor. Interior designers, take note. In terms of furniture there were large timber communal tables which we thankfully did not have to share this early on a weekday (I’m not a dignified eater, it’s best those in proximity are not strangers and are used to my excited, hearty manner of consumption) and at the far end of the room there was a single table with an eclectic collage of fabric chairs which I did not feel up to navigating that morning but did help the place to look quaint. Joy! A big ol’ bowl of oats. I immediately wrapped my perpetually icy hands around the sides and let the rejuvenation begin. Instantly my capillaries dilated as the heat seeped from porridge to person, colour creeping up to my fingers as blood was finally given permission to flow there. Alright, I’ll stop the melodrama, but I was pretty happy. 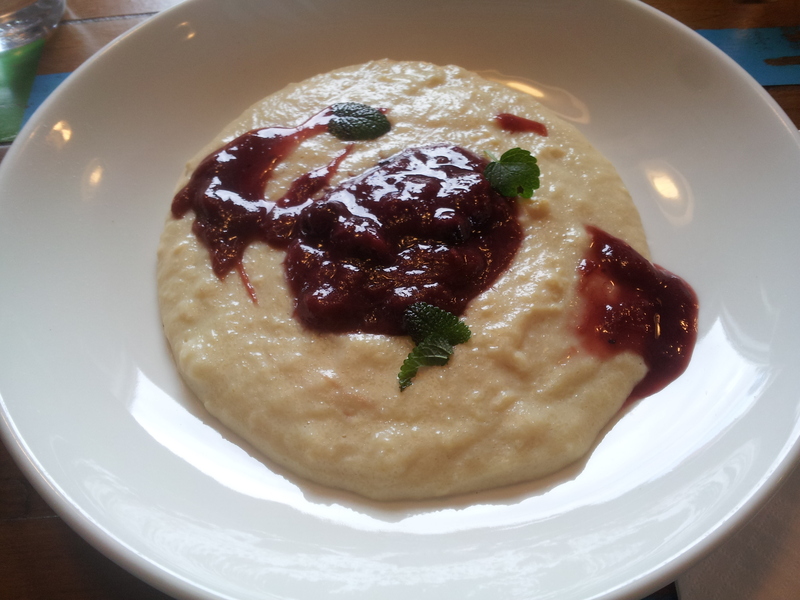 As for the porridge itself; it was hot, creamy and densely oaty. 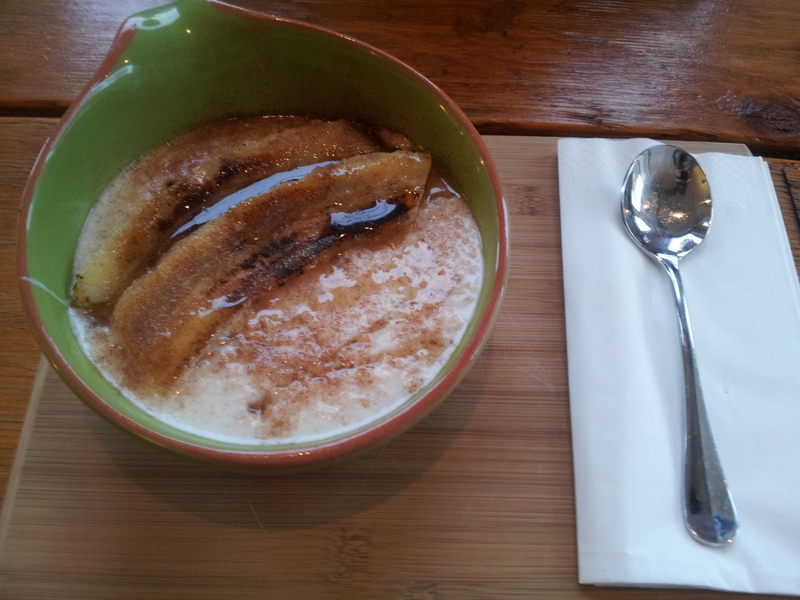 The grilled banana and honey accompaniment perfectly contributed a sweet mushiness to the chunky porridge. I should also commend Clique3 in that they managed to get the amount of milk just right to give the meal some movement without drowning it. Finally, they did not skimp on the serving size – there would have been nothing worse than getting a simple glassful of this porridge. Final Word: If your fingers, hands or cockles of your heart need warming, join this Clique3 before Winter ends and get them to make you their porridge. 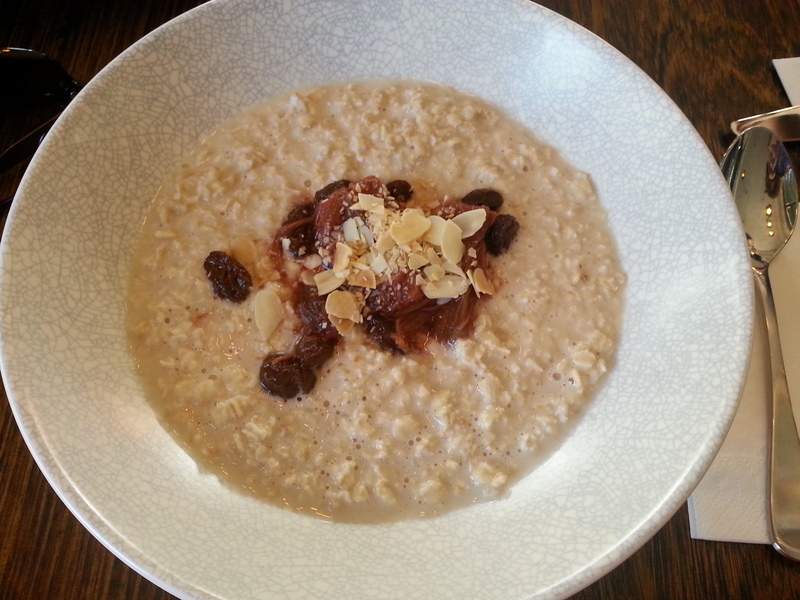 (Just as good as) Good Muesli, Melbourne! I woke up in a state of nervous excitement this morning. No, it was not my wedding day, not even my birthday – today was to be my first porridge review – eeep! While I am a major proponent of muesli in all of its cold glory, I have recently been looking forward to the turning of the seasons so that I would have an excuse to order and review the (hopefully) fancy cafe version of muesli’s hot, steamy cousin – porridge. For this momentous occasion I ventured out West to visit Footscray Milking Station, a cafe nestled amongst the residences at the corner of the leafy Bunbury and Cowper Streets. My sole rationale for going there was that the name seemed quaint and I wanted to feel farmy – and that my intuition told me this would be a place that knows how to treat oats. Lucky for me I don’t often rely on my intuition, but more on that later. Footscray Milking Station has a surprisingly dark exterior serving only to accentuate the cheeriness of the green front door. The interior has a cosy rural feel imparted by a light brick wall, unadorned except for milk vats perched upon wooden shelves. Additionally, the small, square windows closed the place in creating a sense of homely warmth in contrast to the overcast morning outside. Safe to say, I was expecting a warm bowl of gloopy oats in milk and so was completely baffled when this bizarre dish came out. It was awful. In retrospect I should have twigged when I was saying things like “how did they manage to obliterate the oats so completely?” that this was because there were no oats to begin with. Here, I was going to snarkily support the equally oblivious Lady Marmalade’s comment that it had the texture of wallpaper glue. It did, but I think that might be intrinsic to semolina as a food. The Milking Station could have saved the dish with the tart magnificence that is rhubarb, however the compote was a sparse, inadequate distraction from the nightmare I had been served. If only I had realised what semolina was in time (and not almost 8 hours later)! This heavy pâté that was masquerading as “porridge” did fill me up, but not in a good way – I was determined to eat morning tea as soon as I got home so as to quickly erase this food memory. It is not just due to the questionable quality of my photography that these look like burnt pork medallions. Baby Chino reported that he has had pikelets bigger than these and that the money to pancake ratio left much to be desired. We were both disappointed this morning, it seems. It was due to mainly my own ignorance that I had a terrible breakfast at Footscray Milking Station. I cannot comment on the quality of the semolina porridge as for all I know it is supposed to taste like floury, uncooked dough. All I can say is that I will never order it again especially as I now associate it with broken dreams and injured pride. I suppose I should be happy that this doesn’t count as my first true porridge review. (Not even close to) Good Muesli, Melbourne!